From opera to rock, flamenco to folk, here’s your guide to New Mexico music. Above: Chevel Shepherd is on her way to national stardom. Photograph by Shutterfreak. Love New Mexico? So do we. Subscribe today for just $3 an issue and we&apos;ll deliver our award-winning monthly magazine right to your door. 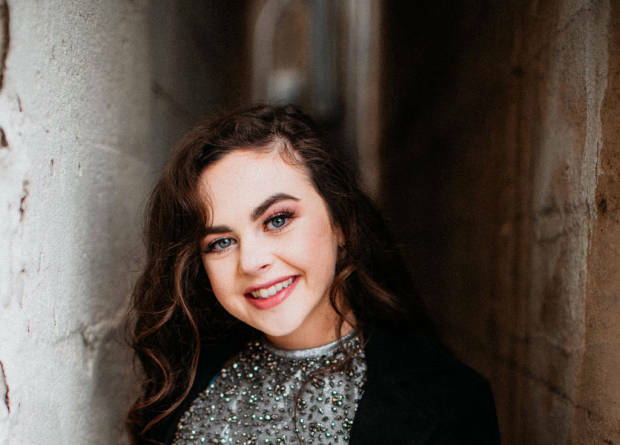 Chevel Shepherd wants to bring back classic country music. Given the 16-year- old’s clarity, motivation, and talent, she’s on her way to doing just that. Shepherd has been singing since she was 2. At 8, she was on the radio. At 9, she made a CD for her dad. “I just kept going,” she says. That included a tryout for the 15th season of The Voice, where Kelly Clarkson took the Farmington native under her wings, on their way to winning the competition in December 2018. Life is a little crazier now—the national anthem at major sporting events, time in the recording studio, commercials—but the high school junior still plans to walk with her class next June. It was just crazy. I’ve loved every second of it. Music is the food of the soul. I love the feeling it gives me, and I love the feeling of giving people a song they can relate to, to make them happy and smile. I’ve always loved to sing, but once the live shows started on The Voice, I realized just how much I loved to get up on stage to sing for different people, to share my passion for country music with everybody. Kelly taught me to always be yourself and you can achieve any goal you want to. I wasn’t nervous at all. I just went out there and had fun showing people what I love to do. I love to do projects that better the world, like global warming [a video for the One Life Project]. I really want to produce albums and sing at the Grand Ole Opry and sing with my favorite country artists, Loretta Lynn and Dolly Parton, be a classic country singer traveling the world and sharing my passion. Classic country isn’t popular like it used to be. It’s not played on the radio across the nation. I’d love to bring it back. It warms your heart. I really can feel all of the support from the whole state of New Mexico—they love their people. Whenever I come back, I just love to see everyone. And our food—the food is amazing. I love to work on cars with my dad. I worked on a ’69 Pontiac GTO. My dad just bought me a 1972 Chevy Chevelle. I just got my permit today. For each performance on The Voice, I had a lucky pair of mismatching music-note socks. I wouldn’t wash them, but they don’t stink. I felt like if I washed them, the luck would wash out. I still haven’t washed them. I’ve never worn matching socks ever in my life. Listen to 101 songs by artists featured in our May issue with this Spotify playlist created by Silver City&apos;s KURU DJ Mitch Hellman. By age 4, Emmy “La Emi” Grimm was studying with María Benítez, the matriarch of New Mexico flamenco and the founder and director of the Institute for Spanish Arts. Now 28, La Emi has performed at the Lodge at Santa Fe, where she saw her first shows, for 15 years. La Emi will headline its summer season. Flamenco is an art form that was born for the people. In New Mexico, we have such a strong culture that dates back hundreds of years, and a lot of ways to express it and what’s important to us. Flamenco is ingrained in my soul. It’s telling a story. It ranges from emotions of falling in love and getting married to when your loved one passes away. You feel the emotion that everyone is putting into it. You can relate to it—feel joy, angst, frustration. You’re taking them on an emotional ride. It’s raw—showing them everything, giving all of your soul. Even if you don’t necessarily understand what the singer is saying, you feel the emotion. You can relate to it. Ashley “Say Wut” Moyer lives to make beats with her breath. She’s also an aesthetician in Albuquerque who’s changing the standard of beauty for women and trans and nonbinary clients. I’m a beatboxer originally from Albuquerque and have been for the last 15 years. I got started at Cibola High School, where I heard classmates beatboxing. I was captivated. I had an ear for it—that mind-body connection, to make music through breath and to keep track of time. Back then, we had a weekly cipher, listening to emcees rap while trying to hold a beat, to maintain stamina, and keep the volume up. I got comfortable improvising and freestyle beatboxing, which I love. After high school, I sought out a community of artists to maintain my hip-hop diet. The original Burt’s Tiki Lounge, on Gold Street, had a weekly hip-hop night. I went by myself—I was 18 at the time and had to sign a waiver that I wouldn’t drink. I had my first battle that night. I know they were testing me because I’m a woman in a male-dominated culture. I’ve heard people say, “Girls can’t beatbox.” With no stage or mic experience, I battled two guys and won, which put me right in the Albuquerque hip-hop scene. As a beatboxer, when I perform it’s usually within the social justice and grassroots scene. The shows I play have to align with my own morals and values of equality and respect. So I’m very selective about nurturing this gift and not just selling out. In the past, I’ve worked with the Juvenile Detent-ion Center, where I helped incarcerated teen girls learn how to make beats and filter their experiences and decompress through art. I hope people have a different perspective of what hip-hop is after watching me perform. It should be creative, connective, introspective. I use the crowd to create a circuit to connect with themselves. That is what hip-hop is about. People say hip-hop’s dead, but as long as I have a beating heart in my chest, it’s alive and well. Above: Eliza Lutz. Photograph Courtesy of James Lutz. I played my first show at Warehouse 21, in Santa Fe, when I was 13. Music is the best way to distill complicated emotions, undefined experiences, and social commentary. People have a certain kind of openness to hearing that in a musical context. I took over the performance venue Ghost two years ago. It was the perfect space for Matron Records to expand and host events, especially in Santa Fe, which has limited DIY venues. Matron Records gives priority to folks who aren’t getting traditionally represented. I started it in January 2016, and it came out of work I was doing around questions of social engagement. I do a lot of promoting and booking—150 events last year alone. Representation is really key. If you see yourself on stage, you’ll be more inspired. Especially women and nonbinary folks who, for instance, want to learn how to use sound equipment. I have synesthesia, and I wrote the album Harrow [out this month], for Future Scars, in color first. I picked burnt orange and lilac and wrote around them. This is the first band that I came into my own as a female artist, after having experienced sexism in the industry. Last year I was sexually assaulted and I wrote a few songs on the new album, songs I wanted to listen to when I had those experiences. I vocalize these issues through music. Two-time Grammy winner Robert Mirabal lives with his family at the foot of sacred Taos Mountain, in northern New Mexico. 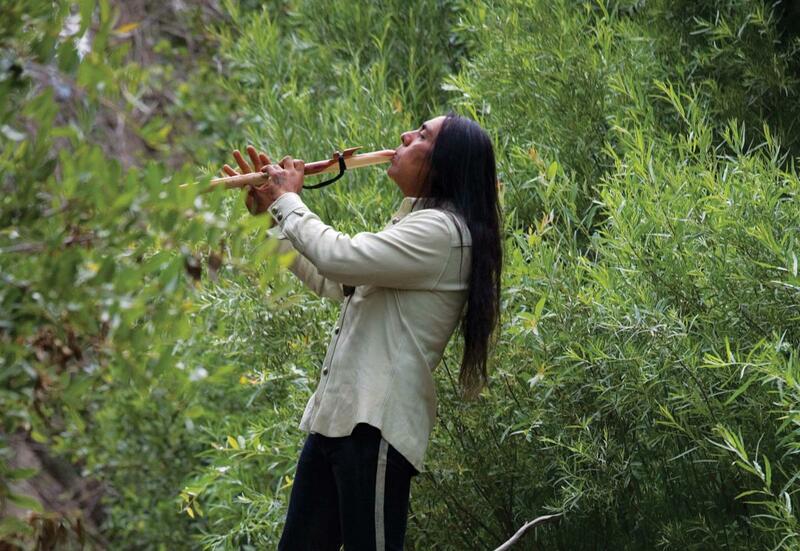 There he maintains the traditions of Taos Pueblo while breathing new life into its music, based on the tonalities of his Native flutes. He is also a composer, painter, craftsman, poet, actor, screenwriter, horseman, and farmer who performs all over the world. Above: Robert Mirabal. Photograph by Kate Russell. The mainstream sees it as traditional music, but to me it’s just music—a modern-day contemporary expression with traditional instruments. I don’t perform too much in New Mexico, but I like outside venues. It all depends on the show. I loved the old Paolo Soleri Amphitheater, in Santa Fe. I still love the Santa Fe Plaza and the Taos Center for the Arts. They all become one gigantic ceremonial stage. What makes music different here is the cultures that are infused in our everyday lives: street signs, food, mud, kachina dances—all these are moments of thought and inspiration. I’ll go anywhere to see a show, a venue in the sage, or the Santa Fe Opera, so long as it’s good. Lately I’ve been digging a group called Lone Piñon. I shared the stage with them at the inauguration of the new governor and loved the sharing of old times, new times, and the love of the lives we live. Drew Newman has spent 10 years as the drummer for IVES. He and his business partner, Ken Riley, who has produced two gold records, run Rio Grande Studios, in Albuquerque, where they record, mix, and master. The best New Mexico music experience was being on stage with the Foo Fighters while they played in front of a sold-out crowd at Isleta Amphitheater. There was a blood moon that night and it was amazing. The most New Mexico music experience for me is sitting around a bonfire at Rio Grande Studios, playing music under the stars. It’s truly enchanting. The music scene is as badass as the food in New Mexico. It’s a blend of different influences—from ranchera to country to rock ’n’ roll. The artists we record at Rio Grande Studios are authentic and real. Isleta Amphitheater is probably our go-to spot, because so many of our friends play there. Seeing a show outside on a summer night is magical. Marble Brewery downtown is always a fun place to perform. Beer and music go very well together. Every Sunday morning, old-school gospel music rises within the walls of African American churches throughout New Mexico (and on KUNM-FM’s Train to Glory program). Cathryn McGill, founder and director of the New Mexico Black History Month Festival, is also a performer and produces a gospel concert every February. Gospel music is the foundation, the essence of African Americans. It’s the music that came with us when we were brought to this country. It’s the rhythmic experience of chants and field hollers. We have this as part of our DNA. Jazz is another uniquely American art form that also originated from African Americans. The Outpost, in Albuquerque, brings in great local and national jazz acts. The Indian Pueblo Cultural Center is a nice place to have a meal and hear music. The members of Mariachi Sonidos del Monte—Christina Gomez, Cynthia Guevara, Sara Maldonado, Gabe Tafoya, Eric Ortiz, Gabe Chavez, Margaret Armstrong, and Santiago Romero—started 11 years ago. Since then, they’ve crooned their way across northern New Mexico and southern Colorado and learned from other renowned groups. Their regular haunts include restaurants, gallery openings, and fiestas. 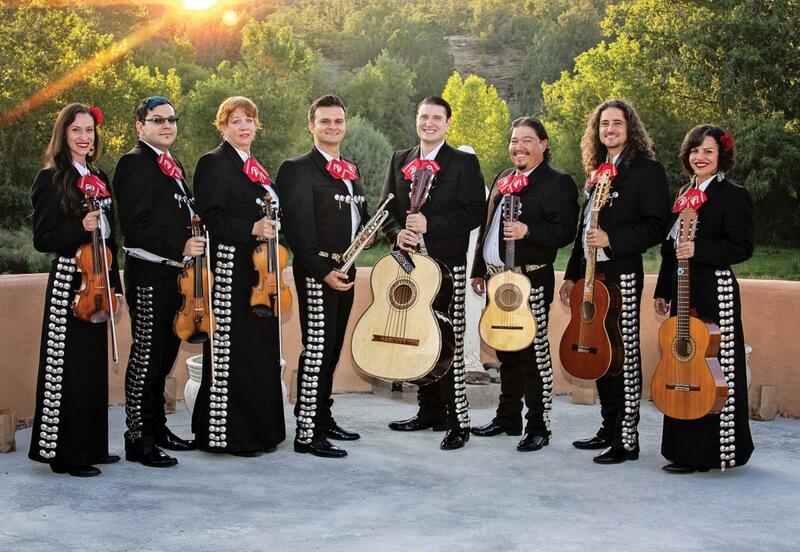 Live at the Lensic, Mariachi Sonidos del Monte’s second album, drops this year. Above: Mariachi Sonidos del Monte. Photograph Courtesy of Mariachi Sonidos del Monte. Our favorite venue to play is the Santa Fe Opera’s Mariachi Extravaganza, the weekend before Fiestas. It’s an all-mariachi show. The fact that you can see the sky behind us is really amazing. I grew up playing music by Perfección, Al Hurricane, and Sparx. I even used to be a local DJ at KDCE radio, in Española. Mariachi is one of those unusual genres of music where you’re supposed to know all of the songs from the past and constantly build up your repertoire. It would be incredible to have contemporary mariachi, but if you can’t play “La Negra,” you won’t get any love. What draws us to mariachi is that the genre is entirely acoustic. People are going back to organic gardening, listening to records, and embracing mariachi. This used to be Mexico, so essentially the music has never left. Mariachi is stronger than ever. Honey Harris is Santa Fe’s favorite DJ, every weekday morning on KBAC-FM. The best music experience I’ve had in New Mexico was the B-52’s at the Santa Fe Opera. The Santa Fe Bandstand’s concert series screams “New Mexico.” The scene here is so multicultural. I like going to the Lensic for live shows, too. My favorite local artist is Lindy Vision. Lindy Vision consists of three sisters—Dorothy (Dee Dee) on lead vocals and keyboards, Natasha on rhythm guitars and backup vocals, and Carla Cuylear on drums, synth beats, and backup vocals. Dee Dee and Carla are pharmacists, and Natasha is an attorney. They live, work, and make music in Albuquerque. “Lindy,” as in “Lindy Hop,” was inspired by the dances in Malcolm X’s autobiography, and “Vision” comes from the trio’s mantra to always dream. (They call their fans “visionaries.”) Their fifth album, Adult Children, Part I, is available. Above: Lindy Vision. Courtesy of Lindy Vision. Natasha: We’re a three-person band, all sisters of Native American (Jicarilla Apache) and African American heritage, born and raised in Las Cruces. We started performing around 2014. Dee Dee: It’s hard to say how long we’ve been playing, since it happened so organically, but it’s been over a decade. We grew up in a rough environment in Las Cruces, kind of as loners. There was nobody else like us, and music connected us with a community and with ourselves. We listened to a lot of Outkast, Lauryn Hill, the Clash, Radiohead. We just started playing music because we felt like weirdos and it was a form of self-expression. Natasha: Our album release party at Meow Wolf was electric. You can’t get that feeling anywhere else—when people get your music and sound, it’s awesome. Before we go on, there’s some anxiety, like Is my equipment gonna blow out? or Will the lights be right? or How is the audience gonna receive us? Dee Dee: It’s so much fun to have people singing and dancing. You know you did something right. We feed off that energy. We’re following the group A Tribe Called Red. 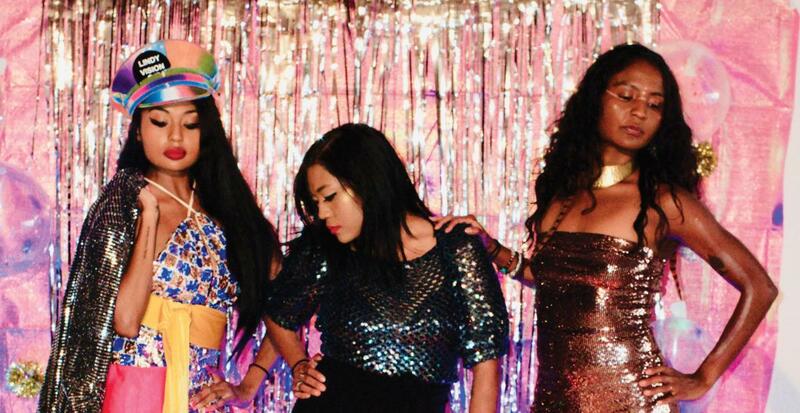 We’ve always loved MIA and Santigold. We’re still digesting their music. They capture a tribal sound and make it modern with disco, techno, and hip-hop elements. They are all these people of color making so many different sounds. Carla: I’m always thinking ahead about our style, and the designs we’re gonna do for a show. Films from the eighties inspire me most, like Liquid Sky, with all its glow-in-the-dark elements. And the cult film Holy Mountain. I’m also inspired by pop musicians—Lady Gaga’s costumes, Madonna, and David Bowie. Dee Dee: We enjoy glam rock and fun, loud outfits, things you wouldn’t wear day to day. We wore our weirdest outfits for the album release party. Carla made a lot of stuff light up. She even had a neon bra that lit up. 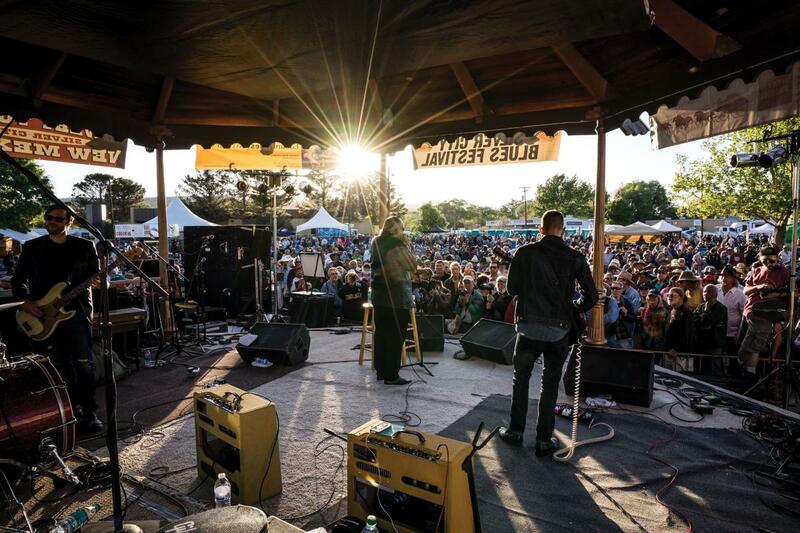 Now in its 24th year, the Silver City Blues Festival, May 24–26, draws performers and fans from throughout the Southwest. Kevin Lenkner, executive director of the Mimbres Region Arts Council, pulled together this year’s lineup. Above: Silver City Blues Festival. Photograph by Jay Hemphill. It started small and humble, just a group of friends who were really big fans of the genre. It was a one-day thing, then it grew and grew into the big three-day event. We get 6,000 to 10,000 people over the course of three days—and our town is only 10,000. We fill all the hotels, campgrounds, and Airbnbs. A lot of local people leave and rent out their houses. It might be one of the last free festivals in the Southwest. It’s not like those festivals where you pay $30 for a bottle of water. The rest of the year, there’s a lot of options for live music. All the bars have music, the library has concerts, so do the coffeehouses, and lots of people host house concerts. It’s an art town, but also a music town, for sure. And people here like moving to the music. They like to dance. Founded by the late Lorenzo Pimentel in 1951, in Carlsbad, Pimentel Guitars moved to Albuquerque and built an international reputation for finely crafted acoustic guitars. Three of Lorenzo’s sons—Robert, Victor, and Rick Pimentel—carry on the luthier tradition, producing about 300 guitars a year, ranging in price from $1,800 to $50,000. We’ve expanded from classical and flamenco guitars to bluegrass, country, mariachi, alternative, even mandolins and ukuleles. You come in, talk to the master builder, and have it built precisely to your specifications. We structure the neck to fit your hand. We fit your body. There’s a lot of beautiful live music in Albuquerque. Our brother Hector Pimentel performs at the restaurant Casa de Benavidez on weekends. We promote two concerts a year at the National Hispanic Cultural Center—that’s a great place to hear performers you might have to travel to New York to hear. And we’re bringing in weekly performers to Hotel Albuquerque, in Old Town. Here at the shop, people take lessons, so there’s always music. It’s nice. We’re building guitars, and they’re playing them. After the release of the album, XIT toured the country, opening for bands like ZZ Top, Joe Cocker, and the Beach Boys. But ultimately, their position proved too far outside the status quo. The government took notice of their resistance and banned the group from the radio. By 1976 the group had disbanded. Songs like “I Was Raised” live on. Violinist David Felberg shepherded the Church of Beethoven’s 2012 transformation into Chatter. The Albuquerque group performs every Sunday morning at the Las Puertas event space, a renovated warehouse, where SRO crowds dress casually, sip espresso, and enjoy a mix of classical and avant garde music. We are thrilled by the popularity of our shows. Parking at Las Puertas is easy, you can wear what you want, we have artisanal coffee drinks, a one-hour show, a sense of community, and tons of variety in our repertoire. That all contributes to our accessibility. It also helps to have one show a week to keep us in the public consciousness. We added poetry by accident—a happy accident—in one of our first shows. Now a poetry performance is an integral part of every presentation. We get fantastic, mostly local, poets. It works well in breaking up the music portion of the show. Our audience is so supportive of us. The great moments for me are when they are totally engaged by what is happening on stage. From Fort Wingate, near Gallup, Wake Self has lived in Albuquerque for the past 10 years. He makes music from the moment he gets out of bed, crafting lyrics that reference liberation, justice, and love. 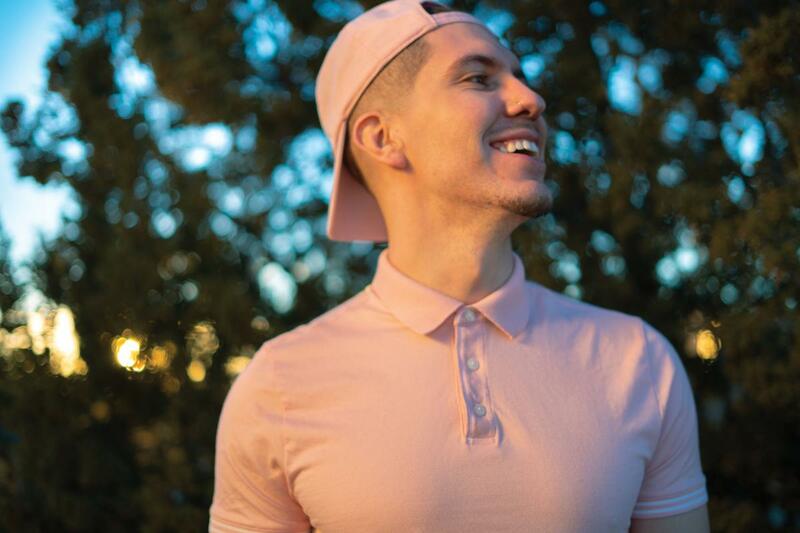 He’s regularly on stage throughout New Mexico and all around the world, and for two years running he’s performed at the Children, Youth, and Families Department Juvenile Justice Services’ talent show in Santa Fe. Above: Wake Self. Photograph by Noor-UN-Nisa Touchon. I’ve always been into music. I think everybody is. We’re made out of music. We’re born on beat. My dad showed me hip-hop, reggae, blues, and soul music. I started writing poetry first to be my journal and therapist. Then I started writing rap songs as a secret pleasure. I used to have this folder and I would write and hide it away. The first time I performed at a venue was a dance studio in Gallup where they threw these breakdancing jams once a month. A friend asked me to rap. A lot of people think you have to move somewhere big to do something bigger, but people make things happen here. Carrying your community and your culture is powerful. If you talk to the people who started hip-hop in the Bronx, they’ll tell you that Latino people helped. We are some of the forefathers, and that needs to be part of the narrative. Our influence is super heavy. Hip-hop is universal. It’s doing it with love and respect. Isaac Aragon was born and raised in Peñasco. He learned to play guitar in his early twenties while pursuing a career as a physical therapist in Albuquerque. His first single, “Love Bless America,” is now available. When I developed my big band, Isaac Aragon & the Healing, I was going for feel-good soul. “Love Bless America” is meant to be a breath of fresh air during this time of political divisiveness. I’m excited about the message I’m sending. Creating these songs doesn’t come easily to me. But when the lights go out on a stage and it’s just you up there, the people give you all the love and joy you need. There’s such a tight community of artists and musicians in Albuquerque who are willing to lend their voices and talents to one another. The places where I like to check out live music are Marble Brewery downtown, where cool musicians play throughout the week; Ben Michael’s, in Old Town, hosts a weekly jazz jam with world-class musicians; and Taos Mesa Brewing’s Mothership always has a good musical act. KUNM-FM (89.9): Based at the University of New Mexico, this public radio station carries national news programs and curates local music programs ranging from jazz, folk, and Latino to metal, Native, and gospel. KANW-FM (89.1): Shared by Albuquerque Public Schools and Central New Mexico Community College, this station’s statewide reach (via various spots on the dial) pumps out national news and local music that includes ranchera, Native, classical, and classic country. 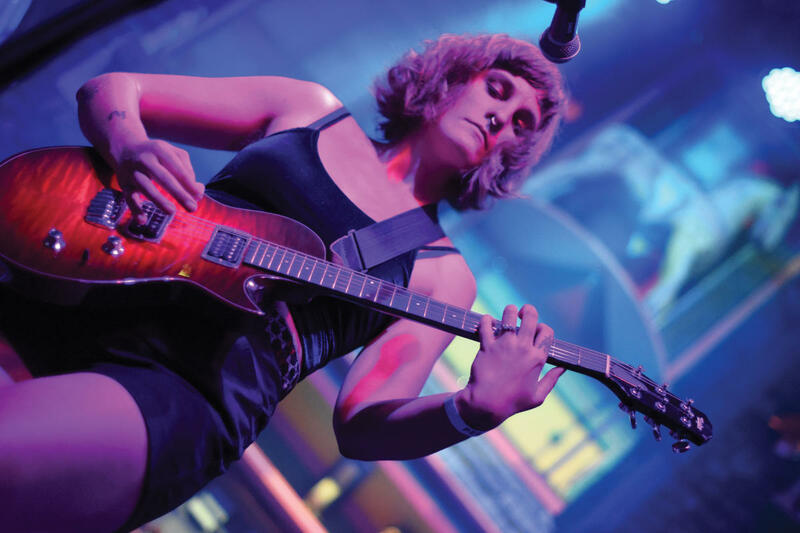 KBAC-FM (98.1): Santa Feans’ favorite place to hear longtime rock favorites and upcoming standouts, including Americana performers and Friday-night funk. KHFM-FM (95.5): Albuquerque’s classical music station also has interviews with musicians, composers, and conductors. KTAO-FM (101.9): Taoseños’ alternatively powered and alternatively minded station, where world music, country, jazz, blues, and acoustic music mix with lost-dog announcements. KDCE-AM (950): From Española, tap into bilingual news, high school sports, and music that includes mariachi, ranchera, country, and old-school rock. KURU-FM (89.1): Silver City’s favorite place on the dial, with an eclectic mix of pop, jazz, rock, blues, Latino, and reggae. KRUX-FM (91.5): NMSU’s student-run station plays their picks (good ones!) all day long. Read more: Hachita, population 49, has one business. It just happens to be the only you need.